Cancer December 2015 Horoscope forecasts that your ability to mix with people will help you become successful this month. Social activities dominate this month and progress in life will be swift. So be ready for a lot of partying, but make sure you use these home remedies to get over your hangover! For the Cancerians in December 2015, family, home and emotional well-being will give way to career and development of outer personality. Knowing your ascendant sign meaning too can help you analyze your personality better. In December 2015, you should focus on important aspects of your career and try to approach work related problems patiently. Your hard work will get due recognition after 23rd and will be financially rewarded. This time is auspicious for people searching for employment or planning to begin a new business venture. Success is likely in the last week of the month. The December 2015 Cancer horoscope foretells that your monetary situation will not be steady and will undergo many fluctuations. Your efforts at making money will have the support of your spouse. Professional sources will be the main source of earnings for the Crabs. Risky investments will be profitable and you can expect sudden windfalls. Singles will have many chances to get into romantic alliances during December 2015. There will be more fun in the relationships. Relationship with spouse will be tricky. Misunderstandings are likely due to conflict of ideas. Singles dating after a breakup should be careful on the path they tread. Pregnancy related issues might cause some arguments. 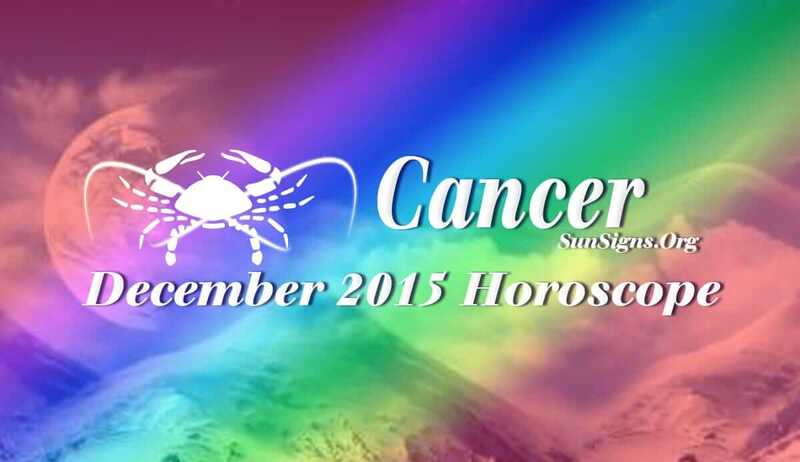 Health will be fragile in December 2015 for the Cancerians. It may be affected by challenges in monetary situation. Be choosy while enjoying with your social connections. Do not let anxiety related problems spoil your health.